Global environmental conservation is the important issue for achieving a sustainable society, and we should play our role as a corporate entity. We face the issues of achieving conservation of the global environment and achieving a sustainable society, while playing our role as a corporate entity. Using our know-how as a manufacturer of specialty steels, we developed TetsuRiki Agri and TetsuRiki Aqua to promote photosynthesis in vegetation with the action of iron ions, and thereby contribute to increases in harvests for gardeners and agricultural industries. We also believe these products can contribute to the reforestation of deserts and regeneration of seaweed bed. 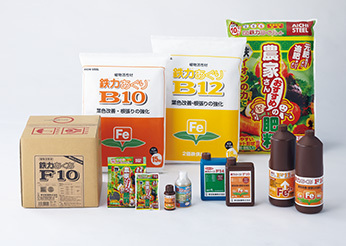 TetsuRiki Agri and TetsuRiki Aqua contain iron in a form that is easy to absorb for vegetation that was developed by Aichi Steel. This leads to the better cultivation of vegetation in agricultural and home garden contexts. The iron in these formulations helps plants to form chlorophyll promoting photosynthesis. The absorption of carbon dioxide also contributes to improving the global environment. Reports from presentations at academic symposiums and exhibitions. See the page below for more information about TetsuRiki Agri and TetsuRiki Aqua products.